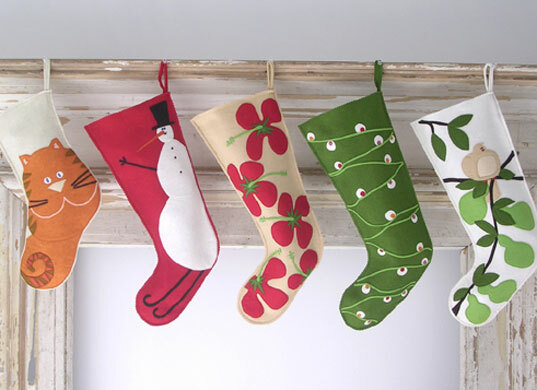 If you’re looking for eco-friendly Christmas stockings to help ring in the holiday season, then a visit to Hable Construction is a must. Hable Construction’s wool felt stockings are handmade by a womens’ cooperative in Hungary, and they boast amazing appliqué details crafted via a traditional hammer and chisel technique. The stocking collection offers a variety of festive options for the entire family in lively, bold colors and whimsical designs for kids, adults and even pets! Hable Construction was founded in 1999 by Texan sisters and design experts, Susan and Katharine Hable. They ensure that all of the company’s products are made by skilled artisans who employ sustainable materials and traditional screen-printing procedures in an old New England factory. In 2001, Hable Construction partnered with a Hungarian women’s cooperative for their stockings and other wool felt goodies. Outside of the wool felt production, all Hable products are made in the USA. these are adorable, but for $135 I would be better off buying a sewing machine and making my own. I must agree with the above statement. I do have a sewing machine, and the talent, not the time. I feel that for these simple stockings they are way overpriced. I do appreciate the beautiful, simple design. I think they are fantastic and as each is an individual work of art, worth the price. However, I would have to buy six so they are out of my range. Well done though, beautiful and original. 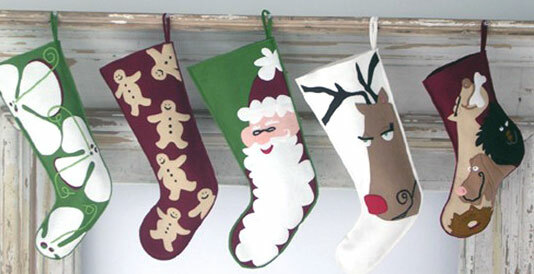 If you're looking for eco-friendly Christmas stockings to help ring in the holiday season, then a visit to Hable Construction is a must. Hable Construction's wool felt stockings are handmade by a womens' cooperative in Hungary, and they boast amazing appliqu� details crafted via a traditional hammer and chisel technique. The stocking collection offers a variety of festive options for the entire family in lively, bold colors and whimsical designs for kids, adults and even pets!